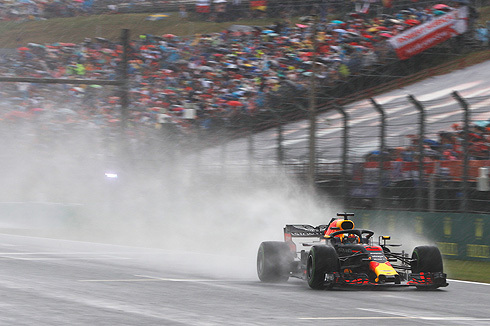 Some rain that began to fall around half an hour before qualifying began and then progressively intensified meant that the session depended on a combination of judgment, opportunism and luck. In Q1 a mixture of slick and intermediate tyres were used, while in Q2 it was a mixture of intermediate and full wet. 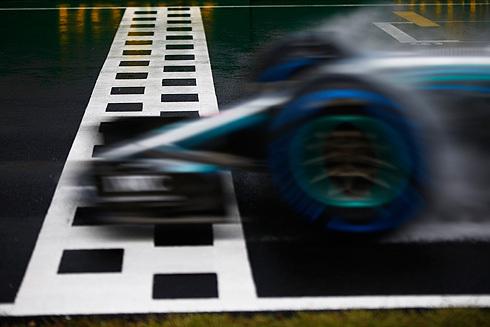 For Q3, all the drivers used only the full wet tyres, with Mercedes driver Lewis Hamilton setting pole position in the closing seconds. He was presented with his fifth Pirelli Pole Position Award of the season (equalling Sebastian Vettel) by former driver Jean Alesi, who made his name in Formula 1 with a Pirelli-equipped Tyrrell in the 1990s. Dry weather and high temperatures, similar to Friday, are expected for the grand prix. As the drivers all used intermediate and wet tyres for qualifying, the entire grid will have a free choice of slick tyres to start the race tomorrow. One pit stop is expected for most drivers, but this will also depend on the eventual track temperatures. The regulations now place the cars into parc fermé until the race with no changes allowed, so it will be interesting to see which teams have focussed on a wet or dry set-up. MEDIUM - Not seen in qualifying but useful for a one-stopper tomorrow. SOFT = Only Daniel Ricciardo used these in one Q1 run. ULTRASOFT - Seen extensively in Q1 before the rain intensified. INTERMEDIATE - Used by all the teams in Q2 as well as at the end of Q1. WET - Used to set pole, and by all the drivers in Q3.